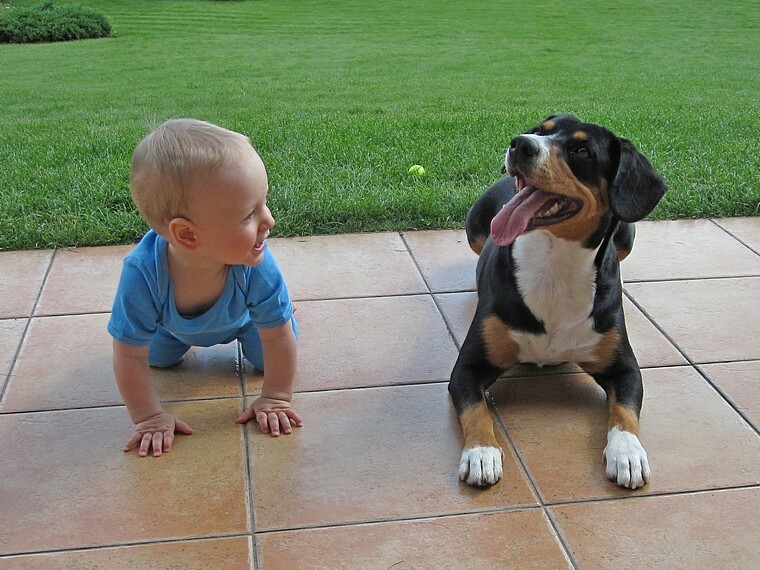 We are the internationally protected breeding kennel of Entlebucher Cattle Dogs. Our aim is to enrich the breeding base and contribute to the promotion of this exceptional breed, which is however still rare and unrecognised in the Czech Republic. We want to raise healthy puppies meeting the standards of the breed that will make their owners happy during training, at exhibitions as well as in everyday life. 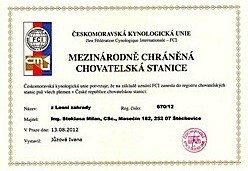 We are members of the Czech Mountain Dogs Association. The name of our breeding kennel is derived from its location at a house with a large garden directly neighbouring a forest. The large garden area provides our females with enough opportunities for exercise – they do a lot of running when guarding her territory. Groups of bushes have so many things to discover, and the females have found numerous hiding places at their strategically important spots where they wait for intruders. The garden is an ideal place also for the first steps outside and exploring trips of small puppies. There is also enough space for various sport activities. Our choice of the Entlebucher Cattle Dog was partially determined by our first dog and the circumstances under which we lost him, a careful study of dog-breed characteristics in our search for a new four-legged friend and also some chance. We had spent eight years with him when we were suddenly deprived of him by a disease that we had never heard of before – cryptococcosis. It was very hard for us to come to terms with the unexpected loss. First we thought that we would never get another dog again, but the garden and the house were strangely quiet, empty and depressing without a four-legged friend. We also were sad, and so we began to consider bringing a new dog into our home. Our situation was already different from when we procured our first dog. Then we lived ‘in seclusion near a forest’ with no occupied houses around; therefore, we wanted a big dog commanding the respect of the passers-by. Nevertheless, we found out that such a dog inspired the respect and fear not only of the passers-by but also where it was not exactly desirable (visits, restaurants, accommodation facilities, public transport etc.). In the final stage of his disease, we realised the truth of the advice that one should choose a dog of only such a size that one can lift to the surface of a veterinary table and the fact that we are not getting any younger anymore and we may not manage that with another big dog. As there appeared new houses in our surroundings, the dog’s size was no longer such an issue. It was also quite likely that our daughters would soon have small children with whom they would come to see us, so they preferred a smaller dog as well. For practical reasons, we began to consider a dog with shorter hair. With Dany, we used to go to a dog training ground, but Hovawarts are not (based on not only our experience) an ideal breed for training. They are primarily watchdogs (which is reflected also in their name) programmed to make independent decisions; as a result, they do not perform any command until after they have first carefully examined the area. As they grow older, it takes longer for them to execute the given command. That was the reason that we considered a breed that would be slightly less independent and more attached to their master. Soon after the family council agreed on the above-listed characteristics, one of our daughters browsed the internet and sent us a description and a picture of a breed that were the closest to our parameters. It was evident that this breed is rather rare in the Czech Republic and that one cannot meet it normally and become acquainted with it. And here we were already assisted by chance, thanks to which we met the breeders of the Entlebuchers. As they had immediately two dogs, we were able to see an adult dog and a young female at the same time. They both absolutely won us over. At first, we were a little surprised by their agility, the unexpected strength considering their relatively small stature as well as their noise while playing – mainly the guttural sound resembling growling emitted by the Entlebucher when playing. By the time we were leaving, we had decided. And we decided well. 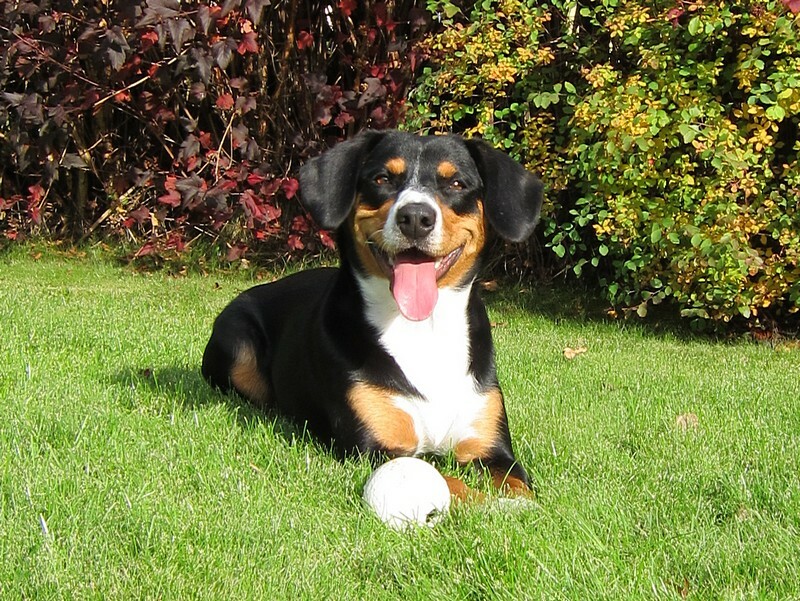 The Entlebucher truly meets all of the characteristics listed above and still adds a specific ‘Entlebucher’ bonus – he unconditionally loves his master and does everything to please him. 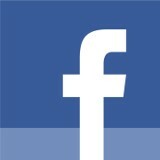 He is good-natured and spreads good humour and happiness around.